Back of card: Navy blue/violet, with (you guessed it) a card from each of the four decks in question. The card: The Lovers, the decks shown in the same order as on the front. Format: The top half is mirrored, upside down, in the bottom half. Each half is divided into left & right. Each of these halves has the Lovers's image from the four decks. So the back of each card has four tiny copies of the Lovers's card, printed in one color only. May be inverted. Booklet included: Yes, 64 pages. Measurements: 2.6 x 4.72 inches, or 66 x 120 mm. Instructions in English, Italian, Spanish, French & German. 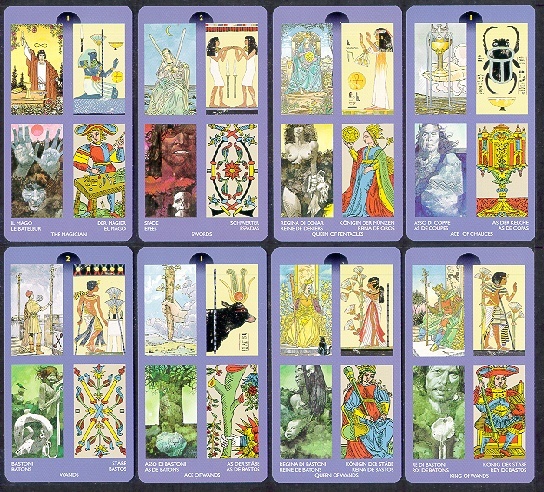 The Universal Tarot, a close Rider-Waite copy. Tarot of the Sphinx. Note that Nefertari's Tarots is the same deck, but reversed. All of these are decks published by Lo Scarabeo. I wasn't too keen on the idea at first, believing that such small images would be too hard to read. After looking at the deck, I find I was mistaken. This is a great way to expand one's understanding of the cards.